Acknowledged by the medical community for its superior performance in helping to heal ankle injuries. It is the patented Duplex™ air cell system that makes the Air-Stirrup so successful at treating severe ankle injuries like third degree ankle sprains. This exclusive system incorporates two pre-inflated overlapping air cells (distal and proximal), that provide support and produce graduated compression when walking around. The compression helps reduce edema, the swelling that is caused by fluid trapped in your body's tissues, as well helping to accelerate rehabilitation. Provides support and protection from inversion and eversion. Ensures you'll get a comfortable fit. The brace is ready to wear...all you have to do is strap it on. Easy to fit in your shoe when it comes time for early protected weight-bearing movement. Thank you for your question. The small Air Stirrup is 6" in height and the Medium is 8.75" in height. Height is measured from the base of the outer shell to the top. Generally the small is used for pediatrics most likely the medium would be sufficient. I have a sev 3 sprain. Doc's prescription said to get a Medium Aircast Ankle Brace. The medical supply store only has size Large (Air-Stirrup ankle brace). My foot is size 11, but I have pretty slim ankles and lower leg. Is Large ok, or should I get a Medium do you think? The Aircast air-stirrup ankle Brace is sized by the hieght of the brace going up your leg, not shoe size. The medium is standard size and has a height of 9", the large is 10.5". The large should be fine on your leg. If you have anymore questions please do not hesitate to ask. Thank you for contacting product support. I'm an old guy 72. My left ankle was infected with a staff infection a year ago. It is bone on bone now. The surgeon said a ankle fusion would help with the pain. Take a look at the Airsport Ankle Brace, this brace has a medial and lateral rigid support. Used for moderate support. The A60 also has rigid support but more streamlined, for Mild Support. After wearing the aircast for a day, the air seems to have pressed out. I've read the warnings about how too much air will make the cast cease to support the ankle. How much air is too much? How often is appropriate to refill it with air? And is blowing in the "straw" sufficient to fill it? After re-inflating the air cell be sure to fold over the tip of the air cell and secure it. You shouldn't need to refill air cell, too much air will not allow the air cell to mold around your ankle. The brace should be comfortable around your ankle. I already have an air cast but it is marked left & I just rolled my right ankle. Can I just flip it around & use on my right ankle? I believe you could try and do that, if for some reason you feel like its not comfortable, you could purchase online. Below find the link. 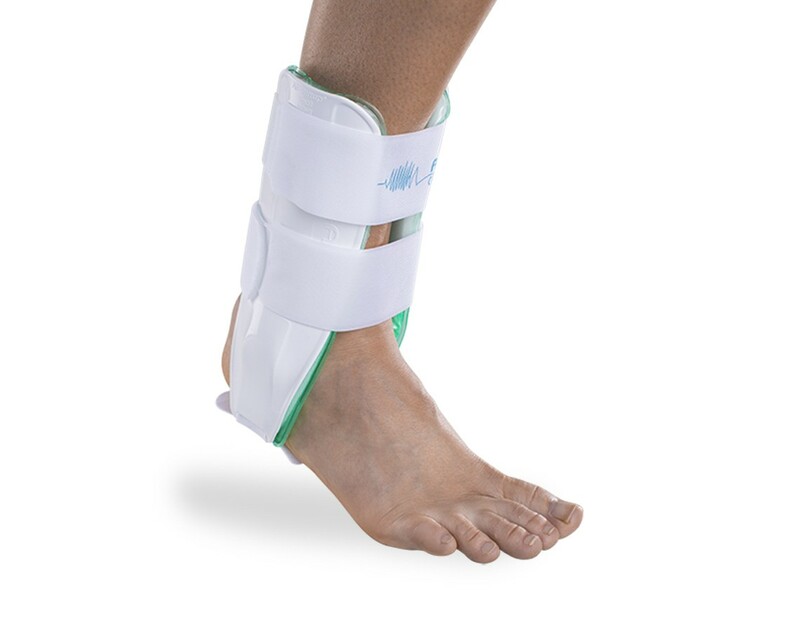 Our doctor has recommended the Aircast Air Stirrup Ankle Brace for my 10-year old to wear while recovering from a sprained/strained tendon in her left ankle. She is 4'11" tall. What size do you recommend? Thank you. Sizing is determined by the length needed for the brace. I believe a small will work, the width of the brace is adjustable, you can change that at any time. The length of a Small will be 8.7 inch's. Please call us with any additional questions. 1-888-405-3251. How long have you had the Brace? You have a 6 month warranty. You shouldn't have a problem with adjusting the amount of air in the air cell. If it's past your warranty, we do have replacement aircells you may purchase. Should I wear this while I am icing my sprained ankle, or should I remove it? Please contact your Physician regarding any restrictions they may have placed for you. Typically when you apply cold therapy to an ankle sprain you do so without any bracing, place a thin barrier between your skin and the ice. Again, contact your Physician with further questions. The strap (under the foot connecting the two side slats) on my air-stirrup ankle brace tore after just a few months use. All other pieces are still in good. Is there any way to get just a replacement strap? Please give our customer service representatives a call at 800-336-6569 and they can assist you in getting that strap replaced. Depending on how long you've had the product, it still may be under the warranty so the straps can be replaced if that's the case. i have an ankle that is very weak, ie, it rolls over VERY quickly and it hurts .. I need a good ankle brace that blocks inversion movement almost completely yet still allows me to play soccer with it on a regular basis..
Also, what are shipping costs to Belgium? A good option for your ankle to give it plenty of support while still getting out and playing soccer would be the Aircast Airsport Ankle Brace. Unfortunetly, at this time, BetterBraces does not ship outside the U.S.
where can I get parts ? You can purchase replacement parts by contacting our customer care 800-336-6569. I received an aircast stirrup ankle brace while in the emergency room, but did not receive any instructions. Should I wear the brace while sleeping or in the shower? Or does my ankle need a rest from it a few hours a day? You should wear it whenever your physicians has told you to wear it. I am not sure of your condition so I cannot comment on that. You can get the Air Stirrup wet, you should rinse it and allow it to air dry. You should rinse it in tap water afterwards and allow it to air dry. Can you swim with the aircast? Yes you can swinm in this, just rinse it with tap water after. I wear a ladies 8-1/2 shoe. What size brace would be appropriate for me? The Aircast air stirrup is based on the height of the brace, which is shown on the page. The shoe size doesn't matter. a women's size 9 would be an air cast small or medium? If you are planning on hiking or being active, I would recommend the donjoy Velocity ankle brace. The Aircast Air-Stirrup is for post injury for everyday activities, inwhich case you could go with a medium. I have a VERY old aircast ankle brace which I shortened by cutting the top 1-2" so that it is 8" from bottom to top of brace. But I'd like to update it. My foot size is women's 11. Would the Small still work for me (since I'd prefer the shortest possible height). Yes, the small would work for you. It is just over 8 inches tall. The Airsport is a better choice to wear during activity and exercising, it provides more joint stability and fits in a shoe better. 1) If my shoe size is a Mens 10 1/2", which size Aircast Air-Stirrup Ankle Brace would I order? 2) Does Aircast still make the "Aircast Sport Stirrup Lateral Side? Please let me know the answers to the above two questions and which model I should order. Depending upon the injury and if you are wanting to be functional with the brace on, will vary for each brace. For post injury the Air-Stirrup brace, being a Men's size 10 1/2" the Medium will be a good size. Recommended by physio treating my bilateral chronic ankle sprain. Repeat taping was irritating skin and didn't provide enough support. Brilliant result as I was virtually pain free, swelling came down and I could walk comfortably. Had to wear with lace up shoes but needed to do that anyway for stability. Ice and elevation still necessary. Eventually needed ligament repair surgery and the surgeon used the splints post-op for stability and swelling. I suffered years of chronic ankle instability after repeated sports injuries. A physio suggested the air cast after a sprain and I was amazed at how effectively it reduced swelling and provided stability that enabled me to keep working and doing usual activities, although sport was curtailed while healing. I wore with flat closed in shoes, mainly runners, as the rigid sides caused wear and tear on the edges of my shoes and I didn't want to damage dressier shoes. I bought both left and right as I had trouble with both ankles. Have since had surgical ligament repair of both ankles, and the surgeon recommended air cast for 8 weeks to assist rehab. The casts helped minimise swelling, prevent inversion and support mobilisation while recovering. After wearing continually the velcro and adhesive became weaker and the air cells came off, requiring double sided tape to reattach - that's the only reason I'm rating 4 instead of 5. My doctor suggested I use this when I sprained my ankle three weeks ago. It's very comfortable and allowed me to just use one crutch instead of two. I sprained my ankle during a tennis game and my doctor recommended this airstirrup. There is something about the aircells in this brace that made my ankle feel loads better when I was moving around. Wearing this brace and a whole lot of ice really helped me feel better.